Dryrain Technologies’ Enterprise Browser for Infinite Peripherals® app seamlessly integrates an iOS device with your Infinite Peripherals Sled by optimizing the functionality you expect from Apple devices with the reliable scanning technology from Infinite Peripherals. It’s the “magic” that makes all hardware and software elements work together for perfect execution with every use. 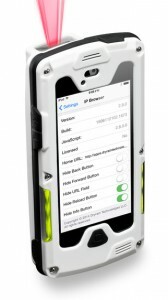 Instead of requiring dedicated and proprietary software to automate barcode data entry into existing apps, the Enterprise Browser for Infinite Peripherals® will automatically transcribe the barcode or MSR data contents into a text field on any web page or web-based app, whether using a generic form, custom form, or advanced input field. Without Enterprise Browser for Infinite Peripherals®, users are required to write new apps from the ground up with custom SDK integration through the iTunes store. Save valuable time and money by utilizing Enterprise Browser for Infinite Peripherals® to enhance your WebApps by adding enterprise scanning and MSR capabilities.